Polytetrafluoroethylene (PTFE) is a manufactured fluoropolymer of tetrafluoroethylene. Being hydrophobic, non-wetting, high thickness and impervious to high temperatures, PTFE is an unimaginably flexible material with a wide assortment of utilization, though it's maybe best-known for its non-stick properties. PTFE Fine Powder is a smooth white polymer which is isolated from a scattering framed by emulsion polymerization. Having a sub-atomic structure of just carbon and fluorine iotas - (CF2-CF2) n – POLYFLON PTFE Fine Powder has the least coefficient of contact and the most predominant warmth opposition, compound obstruction, electrical properties and non-staying property of any plastics. PTFE Fine Powder promptly ingests natural solvents, bringing about the arrangement of glue; it tends to be expelled effectively. It is generally utilized for the making of protected electric wires, spaghetti tubes, thin bars, and unsintered tape. Thermal Properties: PTFE can be utilized consistently at a temperature up to 260° (500°F), and for brief periods at considerably higher temperatures. It likewise has an incredible low-temperature quality. With these predominant warm properties, items, for example, electric or electronic hardware parts, pipe linings, protected electric wires, and so on., made with PTFE Fine Powder are broadly utilized. Chemical properties: PTFE has the incredible property of relatively total protection from all usually utilized synthetics. At the point when utilized with some uncommon synthetics under to a great degree extreme conditions, for example, melded salt metals, high-temperature, high-weight fluorine or trichlorofluorine gas, slight changes may happen. With conventional acids, soluble bases, and oxidants at high temperatures PTFE remains totally steady. Indeed, even contact with natural mixes does not cause disintegration or swelling. The essential explanation behind PTFE's broad use in the compound business for pipe linings, wire-mesh hoses, gaskets, tubes, and roars is in its concoction idleness. Low scraped spot and non-staying property: Under common states of utilization, PTFE has the least coefficient of rubbing of any solids. In addition, it’s astounding non-staying property keeps most sticky materials from holding fast to it. Tubes made of PTFE Fine Powder are consequently utilized as transport tubes for fluid cement, cableway channels, and so forth, for a car and other mechanical businesses, and other comparable applications. Also, an unsintered tape made of PTFE Fine Powder, being amazingly delicate and moldable, frames firmly to the strings of jolts to give a magnificent fixing impact. 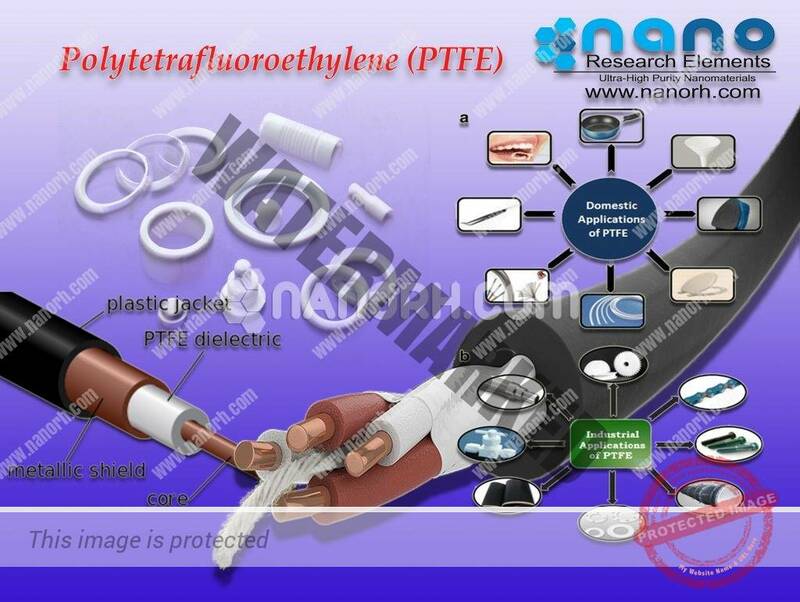 Petrochemical and synthetic handling: PTFE is the material of decision for gaskets, vessel linings, pump insides, washers, rings, seals, spacers, plunge tubes and well-boring segments since it is erosion safe and synthetically dormant; it is unaffected by practically all acids and caustics and capacities in conditions to 500 degrees F.
Electrical applications: PTFE is extraordinary compared to other encasings known. In thin segments, it will protect to 500 volts for every mil. There are evaluations of PTFE which have considerably more noteworthy dielectric quality. It is much of the time utilized in wire and link wrap, and to isolate conductive surfaces in capacitors. Thick walled close-resistance expelled tubing is the PTFE state of decision where machining or boring long lengths to close resilience’s are incomprehensible. Multi-gap tubing can be expelled. PTFE can be machined into standoff encasings and various kinds of high voltage epitome gadgets for electrical parts. Semi-Conductor Industry: PTFE is dormant, and its working temperature run is from short 350 degrees Fahrenheit to 550 degrees Fahrenheit. At the point when made to ultra unadulterated principles it is the material of decision for different things utilized in chip producing, including embodiment gadgets for quartz warmers and some more. Nourishment, Beverage and Pharmaceutical ventures: PTFE is endorsed by the Food and Drug Administration for use in the sustenance, drink, beautifying agents and pharmaceutical enterprises. Thin Film and sheets make a dormant, non-lethal slide surface without minute discouragements where microorganisms can develop. Research center applications: PTFE funneling, tubing and vessels are utilized in different lab products due to their substance obstruction, and dormancy. No contaminants hold fast to the surface. Bearing cushions: Glass-filled PTFE can be cut or stamped into bearing cushions and will oppose all climate-related corruption while remaining a latent interface between divergent development materials, similar to steel and cement. PTFE Compounds: Various fillers can be mixed with the PTFE base gum to improve certain properties, e.g. glass fiber, glass globule, carbon, graphite, molybdenum disulfide, bronze, and so forth. PTFE does not liquefy; it can't be formed into complex shapes, yet should be machined. PTFE is effectively machined utilizing standard mechanical carpentry and stamping hardware and tooling. Most shapes are sold marginally curiously large for simple trimming and machining to correct sizes.